Where Have All The Pen Stores Gone? This article is for those of you that are from the fine cities of Omaha, Nebraska and Houston, Texas, or simply remember the pen stores of the past. I travel frequently to Omaha and lived for two years in Houston, so these had some meaning to me when I stumbled upon them in the past year. 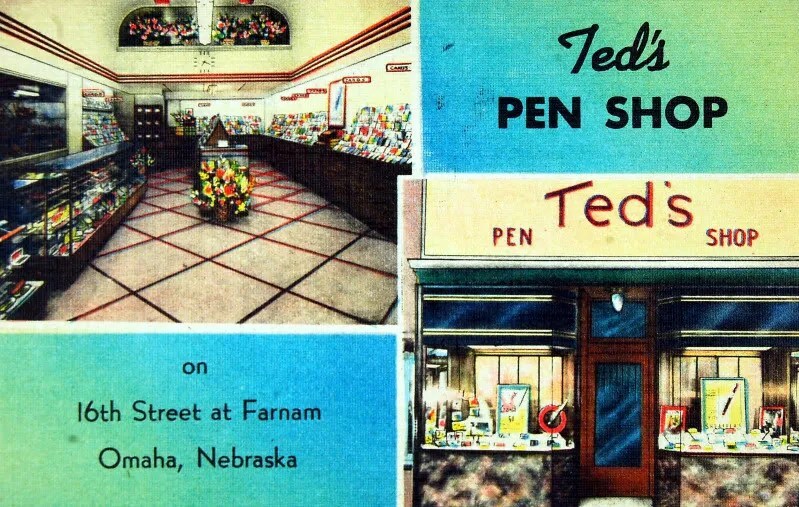 The first is a post card marked as mailed in May of 1946 from Ted’s Pen Shop in Omaha. 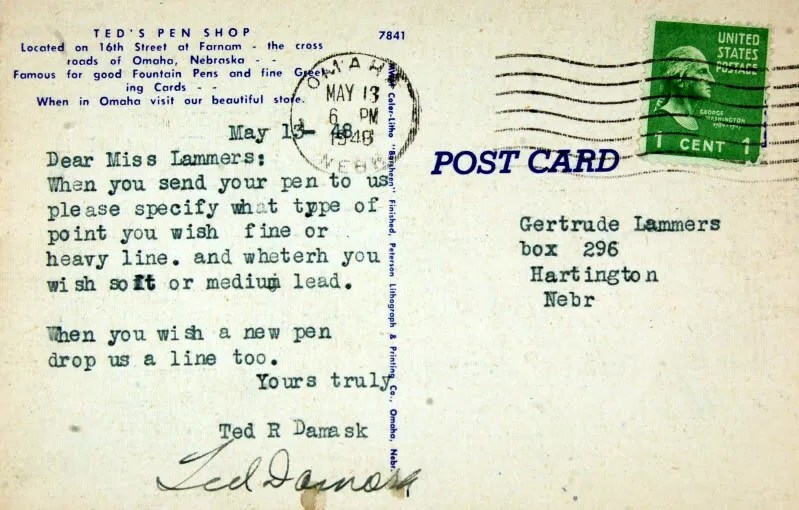 It seems that Ms. Lammers of Hartington, NE had a pen and pencil in need of repair and Ted Damask was writing to advise her what he needed to do the job. A good salesman, Ted, he mentions that she might also need a new pen at some point. A little bit of research shows that Ted Damask was 41 years old when he typed this post card. He died in Omaha at age 54 in 1959. As with many of the fountain pens shops, they also sold cards and stationary. A search of the Lammers’ name in Hartington yields numerous results and Gertrude and her family were, and still are, a prominent name in Hartington. The Google Street map below shows that the corners of 16th and Farnam now contain a Chinese Restaurant, Quiznos Sub Shop, Parking Garage, and Medical Center. The days of the local pen store are past. That is not to say that the pen store has completely disappeared (see Pendemonium in Fort Madison, IA). Many fine stores, both brick and mortar and on-line exist today, but in limited numbers. The second Pen Store is mentioned in this advertising blotter below. Wolfe’s sold and repaired fountain pens, just like Ted’s. They also sold greeting cards and branched out to Stamp Collectors. I have been unable to uncover any information on Wolfe’s, but as you can see from the Google Street map below the blotter, the area contains no evidence of a Fountain Pen Store. Of course, none of what I have written here comes as any surprise to the fountain pen collecting community. We all know that the days of the fountain pen as a common commodity are over and we have to scour the countryside for our favorite vintage (or current) pens. 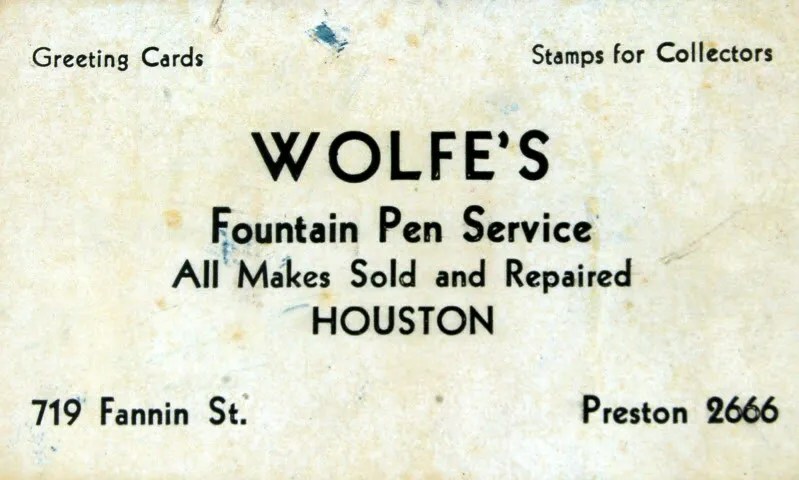 We all dream of a time when you could go into town and purchase a fountain pen at the drug store, pick one out of a catalog, or go to Wolfe’s or Ted Damask’s store. Part of the joy of restoration is bringing the pens available at these stores back to the condition they may have been found in the glass case in Houston or Omaha. At the same time I hope I have shown a new collectible ~ blotters and post cards that depict what Fountain Pens Stores were like in their heyday. As the Holidays approach, don’t forget to frequent your local or on-line pen dealers for your pen collecting (or restoring) needs ~ and have a Happy Holiday Season.